Equipment: satellite TV; DVD, CD player; internet access Wi-Fi (included); washing machine; electric heating. detached house, 4 - 6 people, 4 room/s, 3 bedroom/s, 1 bathroom/s, approx. 100 m², 2 floor/s, year of construction 2009. Bedroom 1: (ground floor): double bed (1.80 m wide). Bedroom 2: (ground floor): 2 x single bed (0.90 m wide). Bedroom 3: (floor 1, roof pitch, room without door): double sofa bed, single bed, seating accommodation. Kitchenette: Kitchen/ cooking equipment: 4 ceramic hobs, oven, microwave oven, dish-washer, refrigerator, combination fridge-freezer, coffee machine, water boiler, toaster. in the living room (ground floor). Living room: (ground floor): furniture suite, wood-burning stove, exit to terrace. From the living room stairs (steep, without banister) to the gallery with sleeping facilities, see bedroom n° 3. Bathing jetty/bathing: bathing place (private use) in approx. 30 m (grass). Information on the boat(s): Rowing boat with motor (5.0 hp; 14.0 foot; approx. 30 m distant; payment, on order). 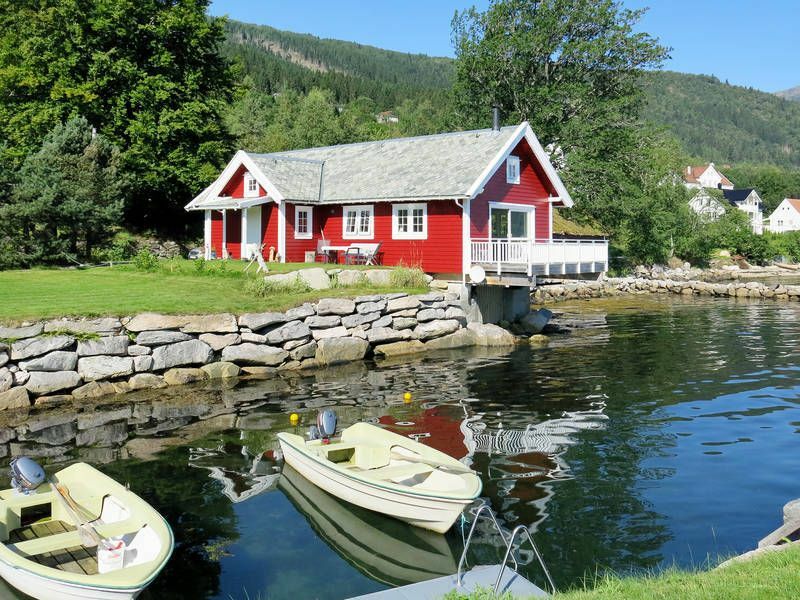 Situation: exclusive residential area, fjord view, view of Sognefjord. Beach/waters: Fjord (without crossing the street) in approx. 1 m (Sognefjord). Nearest neighbour: Nearest neighbour in approx. 40 m.
Next village/town: Center Balestrand in approx. 2 km. Høyanger in approx. 45 km. Sogndal in approx. 48 km. Shopping: Next supermarket (Balestrand) in approx. 2 km. Das Objekt ist gut gelegen und komplett ausgestattet, alles bestens. Übernahme und Übergabe ohne Probleme, sehr zu empfehlen. Séjour très très agréable, situation géographique exceptionnelle, accueil chaleureux de la propriétaire, gîte confortable et présentant tout le matériel nécessaire pour passer une semaine hors du commun !! !